Sometimes people will say to me, "Matthew I wanna do what you do." And I might say, "Well, what do you mean?" And they'd probably say, "Well I want to be a speaker," or "I want to be an author," or "You know, I want to start some great ministry like Dynamic Catholic." And of course their next question is, "How do I do that?" You know? Or, "Where do I start?" or, "How did you get started and what can I learn from that?" It's a really difficult question to answer. In fact, I think it's a question that's impossible to answer. I can certainly tell people how I got started but if I was setting out today I wouldn't necessarily start that way. The world has changed, the way we relate through technology has changed but the thing that I know for sure is sort of the internal disposition. And when God, you know, looks through resumes looking for someone to send out on a mission, what does he look for? You know, he doesn't look for education, he's not interested in where you went to school. He doesn't look necessarily for experience, it doesn't necessarily matter what you've done in the past. He doesn't, God doesn't necessarily look for you know who do you know or who are your contacts or that kind of thing. You see, when you look at the people God has used throughout history, I mean, people that God has sent out on great mission, phenomenal mission, to do incredible things, he almost never picks the people you would expect him to pick. You know? He almost never picks the most likely people. He almost never picks the people in positions of power and authority. He almost never picks the people who are most educated, or best educated. So what does God look for in a resume? You know what I think when God flips resumes looking for someone to send out on a great mission, He's only looking for one thing. It's a little bit like the, the loaves and the fishes, you know? He’ll bring everything else, just bring a little bit you've got, he’ll bring everything else. What is the one thing that God looks for in a resume? Availability. That’s all he wants from you. Availability. He wants you to make yourself available to him. What type of people does God use? He uses the people that make themselves available. And so to pray that prayer of availability, to pray that prayer of, of surrender, to come to God and say, "God I’m a hundred percent available. I'll do whatever you ask me to do. Take what you want to take, give what you want to give, everything's on the table, I'm not holding anything back, just lead me, direct me, I'm a hundred percent available and I will do whatever you ask me to do. That's the people God uses. God answers that prayer every single time. Never once in the history of the world did God not answer that prayer. That's a prayer he answers. 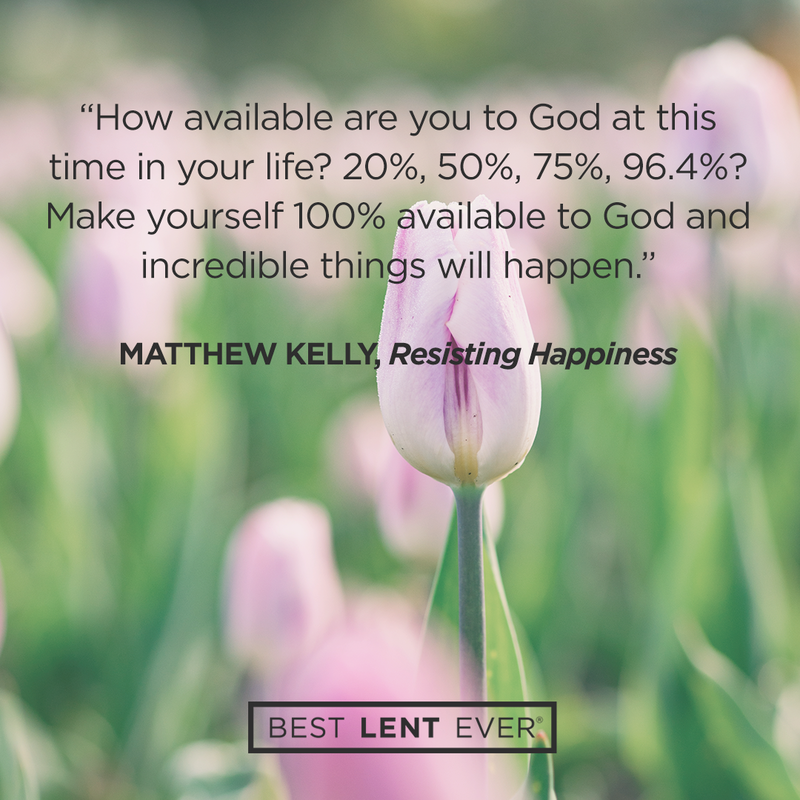 And so the question for today: how available are you to God at this time in your life? Twenty percent? Fifty percent? Eighty-six percent? Ninety-six point 4 percent? And what's stopping you from making yourself a hundred percent available? And is it really worth it? I mean is it really worth it? When you think about what you're missing out on from making yourself a hundred percent available, whatever it is you're holding on for, is it really worth it? Make yourself 100 percent available to God and incredible things will happen. Pray this prayer of transformation every day for nine days. Loving Father, I come to you today to make myself 100 percent available to you. I lay everything I have and everything I am at your feet. Take what you want to take, and give what you want to give. Command me in all things. I will do whatever you ask me to do. Transform me and transform my life, so that I may become the-best-version-of-myself and lead others to you with my life and my love! Amen. Today’s personal reflection features Dynamic Catholic team member Catherine Troll. Catherine is one of our copywriters. She comes to us from Somerset, Pennsylvania. Catherine enjoys ice skating and playing piano, is fascinated by grammar, and was an excellent broomball player back in her day. How available are you to God at this time in your life?